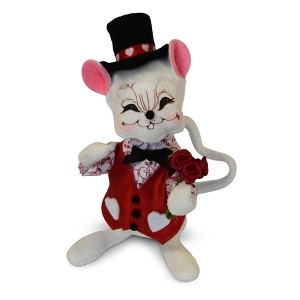 This 6 inch white mouse is wearing a red vest accented with white heart shaped pockets. He is wearing a shirt done in a delicate red and white filigree print accented with a black bowtie. He is also wearing a black top hat with a hatband done in a red ribbon with white hearts on it. Cute item to use in a tabletop display and even cuter when paired with our Valentine Girl Mouse. © 2019 Bob's Garden Center. All rights reserved.